"A refreshing and delicious sandwich. Depending on the way you cut the bread, these can be made as appetizers or a simple lunch time sandwich." Yummy little party sandwiches with cocktail rye bread and cream cheese. To make these the night before, cover with SLIGHTLY damp paper towels, then cover with foil. Keep in fridge. To make as appetizers, cut bread slices into rounds with a cookie cutter. 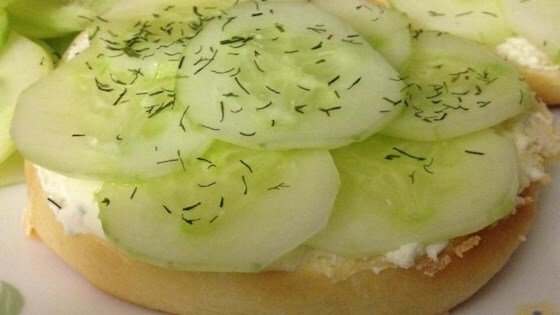 Spread with cream cheese mixture and top each with a cucumber slice. Yields approximately 48 rounds. Great spread. I actually combined this recipe with another. I used the spread to put on a toasted pita, then added cucumers and bacon. It was awsome! Having never tried these before, I thought they were pretty good, if not a little bland. Next time I will definitely be adding dill!!! yummy e kids liked it too! I made these for a brunch and they were a huge hit. I added an extra dash of Worcestershire and made open face sandwiches on party pumpernickel. Delicious, easy to follow recipe. It's a winner!